How Much Will New Zealand Cut Interest Rates? Everyone is focused on the Federal Reserve’s interest rate decision at 2:15pm ET this afternoon, but I actually have my eye on the Reserve Bank of New Zealand’s rate decision. With interest rates already at a target range of 0-0.25 percent, the Fed’s ability to surprise the market is virtually nil. The RBNZ on the other hand has a number of options at their disposal. Business confidence has been improving while retail sales actually increased in the month of February. Yet the recent rally in the New Zealand dollar will lead to tighter monetary conditions for the region as a whole. Prime Minister John Key also openly admitted earlier this month that the country cannot afford additional fiscal spending because it could provoke a credit ratings downgrade. Instead, they are planning to cut government spending. One of few ways to offset lower fiscal stimulus is through monetary stimulus and therefore the RBNZ may be compelled to over deliver and possibly talk of further easing to come. With interest rates at relatively high levels, the RBNZ is not ready to embark on Quantitative Easing. Currency intervention is also unlikely because that has always been a losing battle for the central bank. 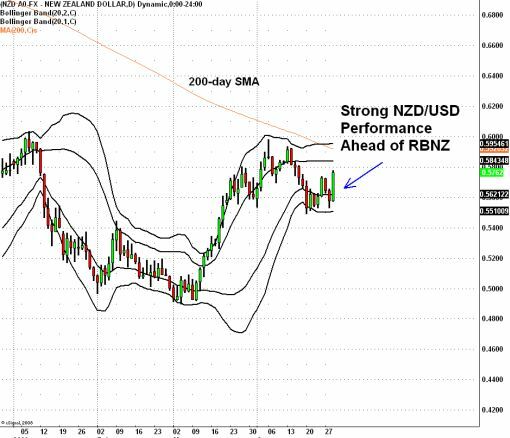 The New Zealand dollar is up more than 3 percent today which suggests that forex traders expect a kiwi positive decision from the RBNZ. Either way, the central bank interest rate decision will play a large role in determining where the currency is headed next.